Last week I was delighted to announce that I’m moving to Malmö to work for Ubisoft Massive as Lead Writer. I’ve been sitting on the news for a while now, so it feels good to have it out there. I moved to Helsinki because I fell in love with Control and knew I had to be a part of it. Letting go of the project was hard, but I know that it’s in good hands with Sam Lake and my talented team. I can’t wait to see the final game they create. The Sudden Stop posted a really sweet farewell message after my announcement on Twitter. I’ll miss the incredible Remedy fan community a lot, and the friends I made here, and of course annoying the HEL out of everyone with my puns, but a MASSIVE new opportunity awaits me. I’m excited to get started. During gamescom, Remedy's communications director Thomas Puha walked the folks at GameStar through the Control demo. The narration is German, but the video still lets you experience a mission midway through our game. The news is finally out: P7 is Control. I finally got to talk about the game at E3. It was wonderful to share the weirdness with everyone. Remedy fansite The Sudden Stop has done an amazing round-up of all the articles, interviews, and videos from the show, so I'll just post our announcement trailer. We got our nomination certificates in the mail and...I guess the nomination is real! It's incredible, but true. Everyone tells me that Horizon Zero Dawn is going to win, but I stubbornly hope that the WGA will recognize the painstaking care and love that went into crafting DOTO. Even if we don't win, we're very happy and honored to have been nominated. It means the world for our labor of love to be recognized. Unfortunately, I can't go to the ceremony. It's too far to travel for just one small event, and my schedule is too busy. Sachka and Harvey can't make it either, so Hazel will be there to reprazent for Team Sporty Flamingos. Cross your fingersthat she brings us home an award! Tonight I was alerted that the narrative team on Dishonored: Death of the Outsider has been nominated for the Writers' Guild of America Outstanding Achievement in Videogame Writing Award. Obviously, we're thrilled to make the award shortlist--especially when we're in such talented company. You can see the list of nominees for all award categories on the WGA website. The presentation ceremony is on Feb 11th, so we'll know then how we did. Cross your fingers for us! So you’ve done your homework: checked all the job sites, networked your fingers off, and followed up every opportunity. Finally, you find a job posting that sounds perfect. It’s your dream job! Yay! Now, how do you convince the studio to hire you? First, look at the job description. Read it carefully. Read it again. Is this really the right job for you? 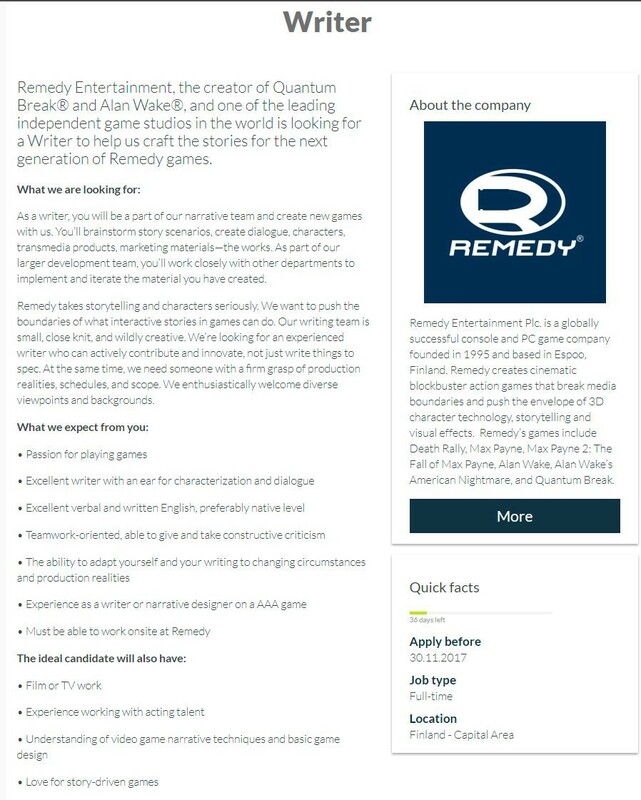 Let’s look at Remedy’s ad for a writer. This isn’t an entry-level role. You don’t need to have the extensive experience of a senior writer, but you do need some experience writing games. Writing for AAA games involves unique constraints, and you should know them. If you’ve shipped an indie game or published a book, the burden’s on you to explain how that experience translates to AAA game development. I encourage you to apply for any job you think you can handle, but be realistic. If you have no games or film experience at all, you’re unlikely to get a senior writing role. Even if you’re an amazing writer, you’ll be competing with other amazing writers who also have experience. “But, Anna,” you say, “How am I supposed to get experience? All the jobs I see expect you to have it already!” Remedy recruiter Petteri Tuomimaa can answer that question better than I can. Hit him up! This is not a remote position. I know, I know. You’re secretly hoping that your work is so dazzling that they’ll make an exception and let you work from home in Kansas. I won’t say that never happens, but it almost never happens. Companies have good reason for wanting you onsite. For senior roles especially, you need to be at the studio leading meetings, driving, schedules, and coordinating with other teams. It’s almost impossible to do those things remotely. The ugly truth is that if they need an onsite writer and you can only be remote, you won’t get the job. Flexibility and teamwork are important. Being a team player, rolling with development changes, and being able to handle constructive criticism are non-negotiable parts of this job. Making games is a collaborative process. Narrative—especially in story-driven games—unites all departments, from programming to PR. You have to communicate your ideas clearly, accept critiques, and make needed changes without getting huffy or hurt. I’m not saying you’ll have group hugs with your team all day, but you need to get along with them and not be precious about your writing. If you don’t like working with other people, then AAA games aren’t a good fit for you. Write well. This is where most applicants have problems, but it’s the most critical part of the job. You must write well, in English, and be able to prove it. It’s cool that you’ve done a lot of design work, or you’re a master at production scheduling, or you’ve memorized every line from Alan Wake. How’s your writing? You must be able to demonstrate, through samples and a writing test, that you can write a compelling story. Okay! So far, so good. You’ve looked over the requirements and they’re a good fit for you. What’s next? Most game studios will ask for a resume and 2-3 writing samples. Resume: I won’t go into detail about the resume because that’s more a recruiter preference, but I will say this: focus on relevant information. If you’re applying for a job as a game writer, don’t send in the same resume you used to apply for your barista job. Make sure the experience translates to making games. If you mention taking CPR classes one summer, explain why that matters for game writing. If it doesn’t matter, why include it? "Writer positions are one of the most applied to jobs, at least in my opinion. It's good to keep in mind that the recruiters will go through many, many applications. Keep your CV short and clear. If you have years of various work experience, try to pick only the relevant ones for your CV, keeping in mind the role you're applying for. Two pages is a good maximum for a CV. Remember to include a cover letter too, and please don't forget to attach the writing assignment /samples." Here’s a helpful thread about what studios look for in samples. Okay, you’ve convinced the studio that you can write. Now what? The process is different at every company, but you’ll probably have a brief interview or phone-screening. Recruiters or HR reps will get a sense of who you are as a person and what your expectations are. They’re looking for obvious red flags like, “Does your company offer pants-optional spaces?” and making sure you understand the role requirements. Relax, be yourself, and you’ll be fine. If your interview goes well, you’ll move on to the next step. Most companies will ask for a writing test, even if you have experience and excellent samples. It’s nothing personal. If you’re insulted by the request, then…well, maybe the job’s not for you. This sums up the biggest problem studios see. By the time you’re asked to complete a writing test, they already know you can write well. What they don’t know is if you can write the kind of games they make. That’s what the test reveals. Do your research. Know what kind of games you’ll be writing for. If it’s a huge company like Ubisoft, check the news to see what projects are currently in development at the studio where you’re applying. Your Assassin’s Creed test will be different from your Just Dance test. If it’s a just-announced title like Remedy’s P7 and there’s no information about the kind of game it will be, look at their other titles. You can get a pretty good sense of Remedy’s writing philosophies from Max Payne, Alan Wake, and Quantum Break. Then write your test in the studio style. Follow the test instructions. This seems obvious, right? Why would you ignore the instructions? But so many people disregard explicit requirements. If the test asks for “no more than five pages,” don’t write ten. Brevity might be part of the test. If the test asks for a fetch quest, don’t write a long cinematic. Write what the test asks you to. Studios want to see if you can write within constraints. Don’t cheat. Look, we get it. Writing tests are time consuming. It’s tough to write a good, sharp script in the short amount of time allotted. You might end up tossing something together at the last minute because your careful planning went wrong. Game studios know this. Professional writers understand. But they want to see what you produce under pressure and how well you write to specifications. If you tweak an existing sample into kinda-sorta matching the test—or worse, outright send pages from a pre-written script—you’re not helping yourself. Studios can usually tell when you fudge the test. Do you think the job isn’t worth the effort? Are you lazy? Will you cut corners on your work if you get the job? Cheating raises questions, none of them good. Just take the test and do your best. Minimize Risks. Writing tests are your chance to dazzle the studio. This is where you show off your command of language, your genius for witty one-liners, or your tight narrative design. Tests are not the place to innovate or try to hit the “inverted hero’s journey” beats you saw on a fanfic site last month. Write what you know you’re good at. Have fun! No, I’m not joking. Most professional writers I know enjoy writing tests. Treat it as a fun exercise, and write something that entertains you. That way, even if you don't get the job, you'll have another sample for your portfolio. If you make it past it the writing test, then you’ll most likely have another interview—or series of interviews—with representatives from various studio departments: art, design, programming, audio, etc. These are the people you’ll collaborate with if you get the job. I won’t offer much advice for the interviews, but try to demonstrate your understanding of the game development process. Be genuine and ask questions. This is your chance to learn more about the industry and that studio specifically. If you don't get the job, at least you've made some new connections. And that’s it. The rest of the hiring process is like applying for any other job. You can handle that, right? What tools should you know and use? Something like Twine, where we can actually play your story, works best. But at most studios, you'll write branching dialogue inside a tool that mimics Word or Final Draft. We definitely want to see how you work with those tools, so have at least one written script sample in your portfolio. On the job, you'll mostly use proprietary game-writing programs, along with Word, Final Draft, Excel, Visio, and Perforce. What if I'm a good writer with no XP? I suggest making your own games. Make interactive stories in Twine, Inform, ChoiceScript, or other similar programs. See if you can join an incubator program like Pixelles. And don't be afraid to go for game writing jobs! Good writing is good writing. It's a lot easier to teach someone the game development process than it is to teach them how to write well. What about applying for jobs in other countries? Moving abroad is a big step—for you and for the company hiring you. Find out visa requirements to see which countries it's easier for you to work in and to make sure you qualify. Talk to the company early on in the hiring process to find out how much help they provide with paperwork and moving. Some companies (like Remedy) offer generous relocation packages, but I've heard that some other companies expect you to handle moving costs and arrangements on your own. This can be very expensive and complicated, especially if you have a family or pets. Make sure you know what to expect. Also, make sure you can handle an international move. Culture shock is real. It can be overwhelming to start a new job, in a new country, with a new language and new...everything. If you don't like change or have trouble adapting to new situations, it'll be tough. All that being said, do it! Working abroad is an amazing, horizon-expanding experience. You'll meet incredibly talented people from all over the world, gain a new perspective on your own country, and maybe learn a new language. If you're a creative person, you'll discover that adventure inspires some of your best work. 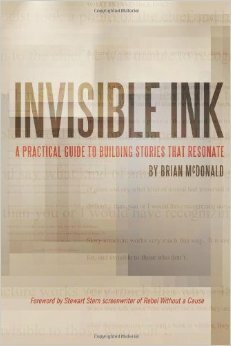 How do I show that I understand interactive writing? What writing devices should I use? These are good questions, but studios expect you to know the answers already. If you're applying for jobs at the AAA level, you should be aware of interactive storytelling's unique demands and know how to demonstrate your understanding. As for which plot devices and twists to use, that's a matter of personal taste. Use your best judgment. Studios want to know what you think good writing looks like. There's no point writing a sample that's outside your normal style if it's not how you'll write on the job. Trust your skills, and write stories you like. How do I break into the industry as a writer? This question comes up a lot and, I'm sorry, but I don't have an answer for you. I got my start in QA and worked my way up, so that's the route I know. But you're right: that path doesn't exist anymore, not the way it used to. Some companies have internships now. Some people make their own indie games first. But I don't know if there's a defined route into game writing like there used to be. Does anyone have any suggestions? "Open applications are recommended. Don't be shy to apply even if you feel that you're not exactly what was described in the job ad! You never know if we have some not yet opened position to which you might be a perfect fit. Quite recently we hired a Junior Writer even though we did not have the position open!" I just saw the game credits for Dishonored: Death of the Outsider. I will never feel less than thrilled and amazed to see my name listed as a writer for a video game. That goes double for work I'm as proud of as this project. Bethesda just released more information about DOTO—which comes out next month, incredibly. There's an interview where Harvey discusses details about why the DLC is stand-alone and what it means for the story. I'm delighted to announce that I've accepted a job as Senior Writer at Remedy Games. I've been a big fan of their work for years, ever since I played Alan Wake. But I never dreamed I'd move to Helsinki and actually work for them. I'm excited about the project I'll be working on. It's a dream story, for me. I can't wait to get started! The video for my ECGC panel in 2015 suddenly appeared on my Twitter timeline yesterday. I'd never seen it before! It was fun to talk about games with Jesse Scoble, Ann Lemay, Mikki Rautalahti. If you're a game writer, seriously add ECGC to your don't-miss list of cons. It's fun and informative. It's an interesting article with thoughtful responses from some big industry names. Definitely worth a read--even if I don't see gameplay times appearing on boxes again anytime soon. 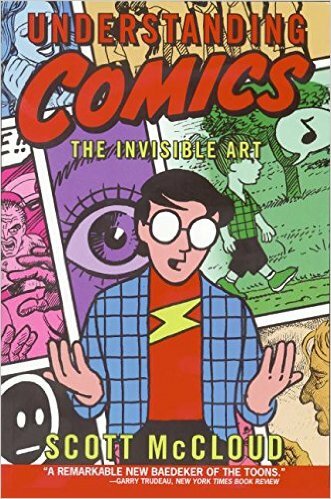 I get a LOT of requests for gamewriting book recommendations. Some of you want a manual or how-to guide that covers the basics. Some of you already work as designers or artists and want to understand the story side of games better. "Anna," you say, "there's a crapton of gamewriting books these days. 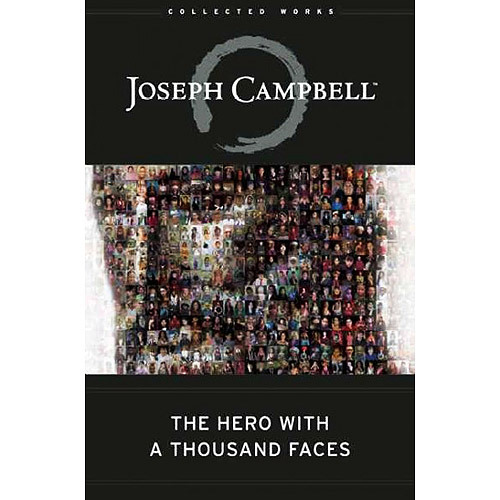 How do I find the best book for me? I don't even know what I need to know!" I hear you. It's tough. But I'm here to help. The best way to learn is by reading books and playing games—and then tearing them apart to understand how they're made. Learn to read and play games with a critical lens. Always ask yourself how the creator makes the story and characters work—or why they don't work. "But, Anna," you say, "how do I get that critical lens?" Okay, fair question. I wrote up a list of resources to get designers started, but it obviously won't help non-designers. So, here's my new plan. I'll write short reviews of gamewriting and narrative design books. And by "short," I mean a sentence or two. These will not be in-depth critiques. I'll discuss the book's focus, its best audience, and how practical/useful/accurate I find its content as a professional gamewriter. I'll add critiques one by one as I finish reading the books. If there's a book not listed here that you'd like me to review, list that baby in the comments. Basics: These books are not about gamewriting specifically, but many are considered foundational texts. Read them with a thoughtful, analytical eye, and they can provide great insight into storytelling structure and technique. If you can resist the temptation to use them as story templates or checklists, they're fantastic sources of information. Reviews: Books that I am reading and reviewing. Slay the Dragon: Writing Great Video Games by Robert Denton Bryant and Keith Giglio - This was a quick and interesting read. It covers writing and game basics like structure and character with lots of bleeding-edge media examples—such as Remedy's recently released Quantum Break. The knowledgeable and well-connected authors are aware of the latest discussions and debates taking place in the gamewriting community. The book includes helpful exercises at the end of each chapter. Best audiences: Screenwriters making the switch to games or interactive media. Novice writers who already know the basics of good writing. Simple, understandable explanations of how game design influences story. Concrete examples that include IF, board games, films, and plays. DISCLAIMER: I'm friends with many of the authors, but I receive no payment of any kind for these reviews. I pay for the books with my money. I read them on my own time. And I offer these reviews not as a promotion or endorsement, but to help readers find the best book for their needs. I've had some extraordinary conversations with fellow gamewriters recently about our inspirations and the games that made us choose this medium as the only viable means of expressing our stories. And I thought, "Why not share these conversations?" I couldn't think of a good way to worm out of it (my brain is a pest), so I'm starting a show on Twitch Creative. Each week (or so) I'll have a guest gamewriter on to play any game of their choosing. They'll walk us through a section of the game and break down what's happening narratively. I think it'll be a lot of fun and very educational for anyone looking to get into gamewriting. Or for anyone who wants a deeper understanding of game story. The title is tentatively "Story Goes Here," but I'm leaning more and more toward "A Million Monkeys" as a jab at all those people who think gamewriting is easy. That title was suggested by Aaron Linde, who will also be my first guest. We're playing Earthbound, I suspect. I'll post more details as the show develops, so stay tuned! The IGDA is holding its first-ever gamewriting jam, the WAG Challenge, and I'm delighted to be one of the judges. As with traditional game jams, participants will design a game based on a pre-selected theme and some optional add-ons. They'll have a month to produce a 20-minute game that will be judged on its narrative and writing. I'm excited to see what people come up with. More panels coming up. I'll be speaking at the East Coast Games Conference this coming week. I'm on two panels. It's my first time at ECGC, so I'm excited to check it out. If you have any questions for either panel, you can tweet them to #InsideStory and #diversityECGC and we'll try to answer them. Check out the adorable graphics for our panels at PAX East. I'm really looking forward to talking about Project Untold. The schedule is up for PAX East! You can see it here. Looks like an interesting lineup. I see quite a few intriguing panels I need to catch. Both of my panels are on Saturday. One is first thing in the morning; the other's in the late evening. Going to be a long day! The Censorship panel is my brainchild. Recently, it's been clear to me that many people have no idea what censorship is or how games are made. I tried to find knowledgeable speakers from every corner of the industry—AAA to indie to mobile—and I'm gratified by the expertise and experience represented on the panel. We're looking forward to dispelling some myths. For the empathy games panel, I'll speak openly about Project Untold for the first time. And there are some talented indie devs talking about games like This War of MIne and Always Sometimes Monsters. You can learn more about that panel over on Ken Gagne's blog. Here's the info from the PAX schedule.